The board of Chile’s copper giant, Codelco, has unanimously agreed to authorize its chief executive, Thomas Keller, to go ahead with the necessary feasibility studies to turn its subsidiary Gabriela Mistral into a new business division. The world’s biggest copper producer seems to be yielding to pressure from the Copper Workers Federation (FTC), which have been intermittently protesting against an alleged privatization of the mine, reported local newspaper La Tercera. "The unanimous approval is the successful culmination of a process led by the FTC to prevent the privatization of this site with an annual production of around 150,000 tonnes of fine copper," the union said in a statement. If sold, minera Gaby was reportedly ready to be acquired by China’s Minmetals. The potential new division, which would be called Gabriela Mistral after a famous Chilean Nobel Prize poet, currently employs 539 people. It is well known for being the local operation with the largest number of women in both production and administrative areas, equivalent to 23% of the workforce. Located in the Antofagasta Region, in northern Chile, 2,660 meters above sea level, the copper mine has reserves of 620 million tons of oxide ore with grades only about 0.45% copper on average. The mine began production in 2008 and is operated by Minera Gaby SpA, a subsidiary 100% owned by Codelco. 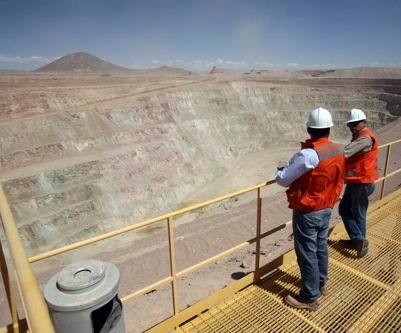 During the first quarter of 2012, the mine produced 35,000 tons of fine copper, 66% more than the same period in 2010. Gabriela (or “Gaby”) is Codelco's second greenfields mine that has developed from discovery to production.